SCW Fitness Education announced a new lecture series discussing business management and financial advice delivering expertise from industry-leading, well-informed female fitness executives. The Women’s Leadership Summit at SCW MANIA® delivers comprehensive presentations from industry leaders like SCW CEO Sara Kooperman, JD, SCW Expert Presenter and Fitness Industry Consultant Doris Thews, Owner of Shapes Fitness Ann Gilbert, Creator of Tabata Bootcamp, the Gliding discs exercise program, and OneDay2Wellness Mindy Mylrea, and International fitness and dance presenter Jenn Hall. To register for the Women’s Leadership Summit at SCW MANIA® in Philadelphia on Thursday, September 20, visit our website (www.scwfit.com/philadelphia/leadership-summit/). For other upcoming Women’s Leadership Summits, register for Midwest MANIA® here and Boston MANIA® here. The Women’s Leadership Summit is a day-long event benefiting the early and the experienced owner, director, manager, or trainer. Valuable presentations and active discussions from the women leading the fitness industry explore a wide variety of topics including service and sales, program selection, management solutions, and social media expertise, among others. CEO of SCW Fitness Education Sara Kooperman, JD, says the panel is focused on paying it forward from the top fitness professionals in the industry to budding owners beginning their business. Sara began SCW Fitness Education as Sara’s City Workout over 30 years ago and has since served as the CEO of WATERinMOTION® and as a board member for the Women in Fitness Association (WIFA). “By providing the Women’s Leadership Summit, we are continuing to make the world a healthier community,” Sara said. Ann says the summit delivers thoughtful conversation about common insecurities faced when transitioning from a fitness professional to a business owner. The goal of the Women’s Leadership Summit is to explore proven strategies and successful practices for career advancement, program profitability, club success and personal fulfillment. A sit-down lunch and round-table discussion allows attendees the opportunity to engage in conversations with skilled female business leaders in the most competitive industry out there. To attend an upcoming Women’s Leadership Summit at Philadelphia MANIA®, register online here. For other upcoming Women’s Leadership Summits, register for Midwest MANIA® here and Boston MANIA® here. 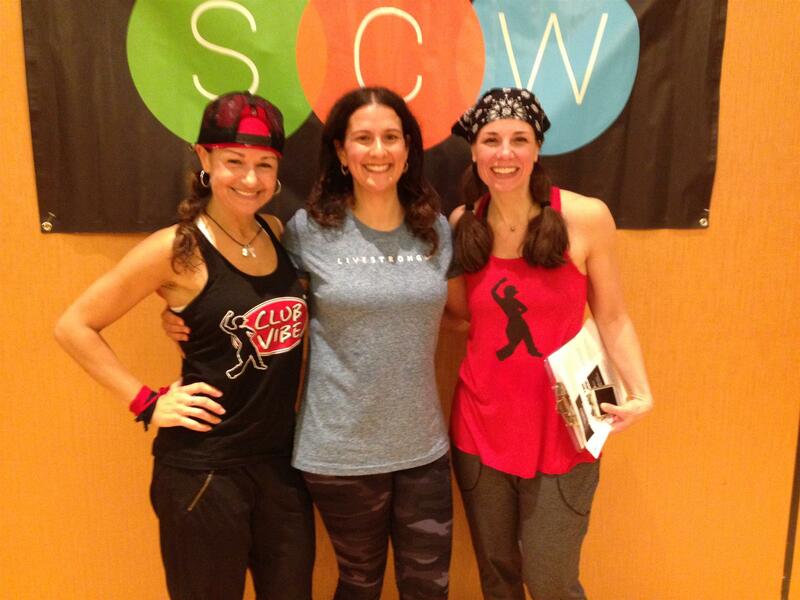 Tricia Silverman, RD, MBA, was recognized as SCW Best Female Presenter at Atlanta MANIA®, an honor that inspired and challenged her to become a better presenter and fitness educator. She credits her win at the SCW Fitness Idol competition in 2016 as the catalyst for beginning her career as a national presenter for SCW Fitness Education. “If you can believe it, winning fitness idol was one of the most surreal moments in my life, right up there with giving birth, and getting engaged,” she said. Tricia is a registered dietician, certified group fitness instructor, personal trainer, and wellness coach. After a successful year of presenting at every mania Conference, SCW Fitness Education approached Tricia about writing her own certification on active aging and nutrition. Tricia then wrote the manual and exam for the SCW Nutrition for Active Aging Certification, which she has successfully lead since April 2018. Tricia currently teaches Nutrition Entrepreneurship and Healthy Aging at Northeastern University in Boston. 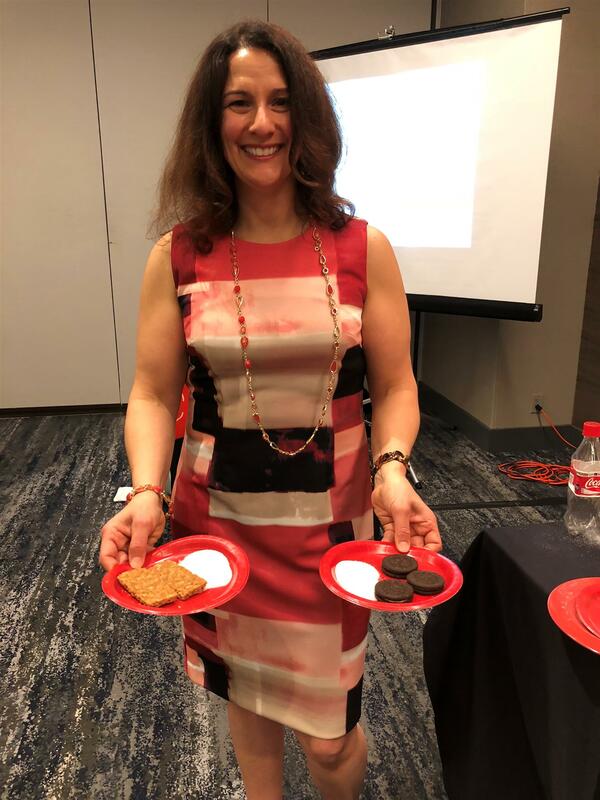 Most recently, Tricia presented the “Nutrition and Sleep: Fascinating Connections” session at Dallas MANIA® and received over 85 participants who packed inside the ballroom to hear her speak. 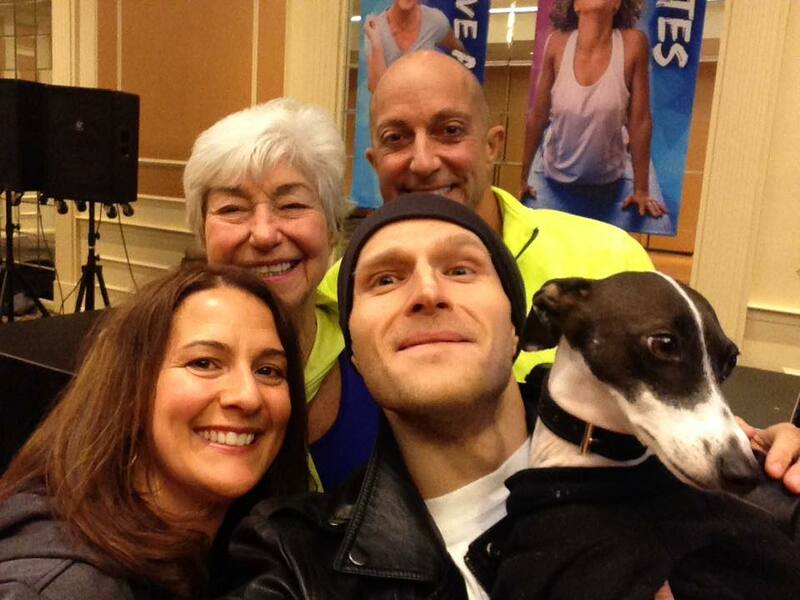 Tricia is inspired by the many talented fitness experts and professionals who present and attend MANIA® conventions each year. After winning Fitness Idol at Boston MANIA® in 2016, she attended SCW MANIA® in New York City to take any and all nutrition sessions offered. 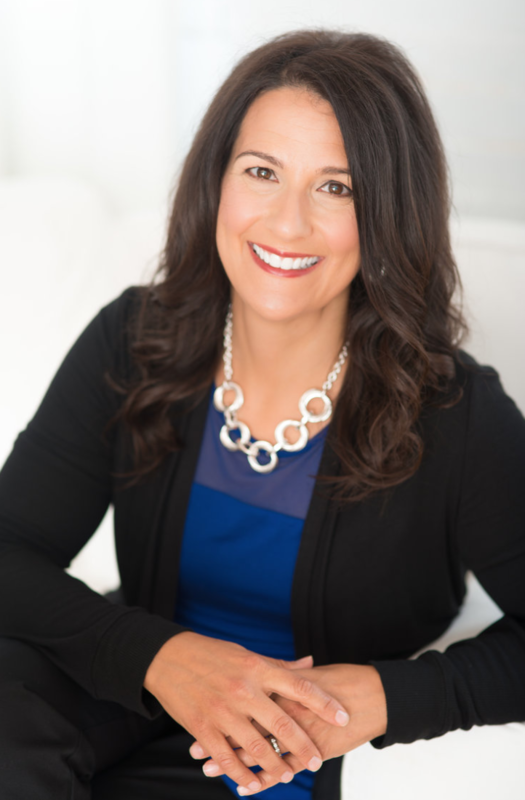 Tricia sought out mentors like Dr. Len Kravitz, Fabio Comana, MA, MS, Melissa Layne, M.Ed., and One Day to Wellness creators Bruce and Mindy Mylrea, among many others to learn from their teaching styles and advance her own. She held conversations with experts like International fitness presenter Keli Roberts and Schwinn Master Trainer Francesca Kerr to build relationships and boost self-efficacy. She held things in common with fellow presenters, creating a space at SCW MANIA® she found familiar; a place she would call home. The winner of the Fitness Idol competitions at SCW MANIA® receive a slot as a presenter at a future MANIA® convention, coverage in SCW press releases, gifts from sponsors, and mentoring from the professionals who serve as the judges. If you’re interested in applying for fitness idol, visit our website (www.scwfit.com/IDOL/). Mindful Movement Specialist and Lawrence Biscontini, MA, is someone Tricia has admired for years now. She was given the opportunity to learn from Lawrence and eventually hired him for one-on-one mentoring. Tricia knows the SCW Fitness Idol competition helped to grow her professional career in numerous ways and promoted personal growth. After encouragement from SCW Event Planner and Staff Coordinator Denise Johnston, Tricia felt empowered to take a risk and audition on a whim. She only spent 45-minutes to prepare, gathering her favorite nutrition props such as a bag of sugar and teaspoon used to show how much sugar is in M&Ms, colored plates, and her three “best” minutes of material. 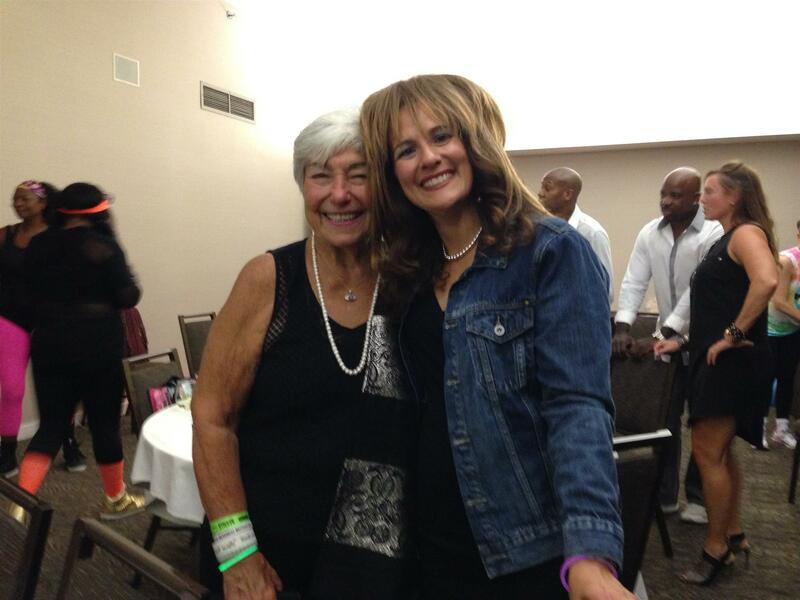 After her presentation, Tricia was overwhelmed with compliments from the many fitness professionals who attend Idol. Tricia encourages anyone thinking about competing in a Fitness Idol competition to take the risk and sign up, or show up, for idol at the next MANIA® conference. Sign-up for Fitness Idol by going online to: https://scwfit.com/idol/, or as Tricia did, take a risk and audition for idol at the conference! Gyms around the globe are adding dance to their schedules, packing group fitness rooms full of members who love to move! When you combine great choreography and great music with a format that inspires peace, love and unity, you have a winner. Everyone knows dance is fun, but it’s also really good for your physical and mental health. Dance has shown to boost memory and reduce stress by raising your natural levels of endorphins. It also improves balance, flexibility, and strength. It’s good for your heart and gives your lungs a great workout. Plus, it’s a calorie buster! Who doesn’t love the fact you can burn hundreds of calories while smiling and having a great time? Perhaps more importantly, dance drives sociability and a sense of belonging. Dancing is recreational, entertaining without any cultural barriers. People from all parts of the world with different ideologies meet on the dance floor and unite together as one. U-Jam Fitness® is no longer a west coast secret. It’s is an athletic, urban dance fitness workout that combines hot choreography and killer music for a fun, calorie-burning workout! Creators Susy and Matt Marks have been spreading their message of peace, love, and unity to people around the globe for the last 8 years. As the love of U-Jam spread, so did its reach. Currently, U-Jam Fitness classes can be found in 32 states in the nation and 15 countries worldwide. Grassroots driven, U-Jam Fitness® puts the -UNITY in community and has grown exponentially by embracing this movement and paying it forward to others. The message of “Peace, Love, Unity and Acceptance for all” is instilled in all instructors. U-Jam Fitness® celebrates diversity, inclusivity and remains dedicated to help change the lives of men and women of all fitness levels, ages, shapes, and sizes. 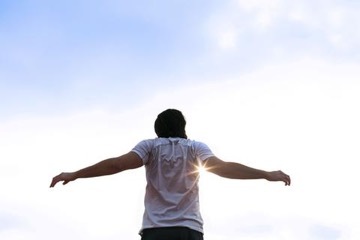 Classes create an environment where you can experience an emotional release, mind-body connection, and a sense of community while burning anywhere between 400 to over 800 calories! We invite you to check out a class for yourself and you will see every student having a great time while working up a sweat. You will become addicted after your first class! U-Jam is very passionate about providing opportunities for the instructors to make a good living doing what they love: dancing, inspiring, and teaching others how to dance. A small, monthly fee of $30 per month gives instructors access to engaging choreography and educational modules that teach them how to set up their own primary business or side hustle, along with a host of coaches and mentors to help guide them to success. For more information on how to join the U-Jam Movement, please email us at: info@ujamfitness.com. Get to a MANIA® near you to experience U-Jam Fitness® and a variety of others! School is back in session and that means the return of our favorite fall sports. We reached out to Power Systems Master Coach and University of Oklahoma’s Director of Sports Performance Coach Bennie Wylie, Jr. to find out how he, his coaches, and his athletes switch gears from pre-season training to in-season training. BW: “This time of year is very exciting. I love pre-season, the prep, the work, the time, the early mornings – and we do it all for the in-season. This is for all the marbles. Going from pre-season to in-season is an easy transition because the energy and anticipation is high. BW: “This time of year, coming out of summer, clients should feel pretty good. They have been training hard to look their best outdoors and on vacation. But with Fall comes tailgating, Thanksgiving, Halloween candy, Christmas and Holiday parties aren’t far behind. So now is time to help your clients set good, quality goals that are attainable for the Fall. Visit a MANIA® conference near you to try out Power Systems equipment! Register on our website (www.scwfit.com/mania). To register and attend the expo for FREE, visit www.scwfit.com/expo. SCW MANIA® is pleased to partner with Trigger Point™ as one of our industry leading experts on recovery, active aging and mobility practices. You can find Trigger Point™ education at MANIA® conventions around the country (www.scwfit.com/MANIA). Foam rolling is a popular and scientifically proven way to reduce muscle soreness and increase recovery time. The progression of foam rolling from its roots in physical therapy to its current use in recovery for athletes and fitness professionals allows companies like Trigger Point™ to innovate and create products that target improvements to range of motion, flexibility and overall performance. The GRID Vibe Foam Roller is the newest and most advanced product available from Trigger Point™ which combines their patented GRID pattern and vibration to benefit muscle compression and self-myofascial release. To try the GRID Vibe Foam Roller from Trigger Point™ at SCW MANIA®, visit the EXPO (www.scwfit.com/expo) , or register to attend sessions like Trigger Point™ for Movement with Sylvie Patrick. The science behind foam rolling has developed dramatically in the last ten years. According to a recently conducted study from Trigger Point™, the GRID Vibe seemingly reduces pain more effectively than a standard, non-vibrating foam roller. Foam rolling, in general, is effective at improving range of motion and flexibility, but the GRID Vibe stands out as superior to non-vibrating foam rollers in immediately reducing pain after use. Vibration technology has historically been used in rehabilitation and physical therapy practices. Research suggests that such stimulation reduces pain in nearly 70% of patients suffering acute and chronic musculoskeletal pain caused by injury, repetitive motion, and overuse. If you’re interested in the GRID Vibe Foam Roller, visit the Trigger Point™ website at: https://tptherapy.com/product/GRID_Vibe. Trigger Point™ is a proud sponsor of SCW Fitness Education and SCW MANIA® conventions. To connect with a Trigger Point™ representative, or register for an upcoming MANIA® conference, visit our website at: www.scwfit.com/MANIA. To register and attend the expo for FREE, visit www.scwfit.com/expo. SCW MANIA® is pleased to partner with Namirsa to include sponsored sessions like “Electric Stimulation for Athletic Performance” with Steve Feinberg. To attend SCW MANIA® in Philadelphia and see how EMS could work for you, register for SCW MANIA® on our website (www.scwfit.com/philadelphia/register). Electronic Muscle Stimulation (EMS) trains your muscles in a way that workouts will not. It is commonly used by professional athletes, body builders, power lifters, and professional dancers among a long list of athletes from all sports to enhance their workouts and training programs. EMS — also known as Neuromuscular Electric Stimulation (NMES), Muscle Stim or E-Stim — sends electronic pulses to your motor nerves in order to create contractions that release sore muscles. When a Namirsa EMS unit is added to your training, it helps to maximize your muscular effort by engaging a greater percentage of muscle fibers. 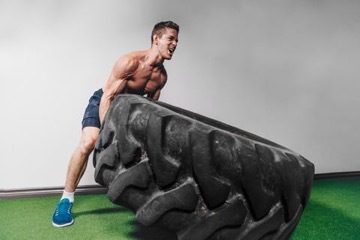 SCW Expert Presenter Steve Feinberg says EMS targets both Type 1 slow twitch muscle fibers and Type 2 fast twitch muscle fibers for performance and recovery benefits. Namirsa EMS units are often used by Physical Therapists and Chiropractors to help patients deal with pain management, stress, fatigue, and muscle soreness. As an alternative to pharmaceuticals, our devices will consistently work faster and more effectively than pills or creams. EMS is not meant to replace your fitness routine, but rather to enhance your workouts. Athletes can use pre-programmed workouts on the Namirsa device to help maximize their training. Namirsa has multiple post-workout programs available to jump-start your Recovery. EMS is often confused with TENS (Transcutaneous Electrical Nerve Stimulation), a common modality used in physical therapy offices. EMS provides an electrical current at a specifically designed frequency to target motor nerves. TENS is designed to target sensory nerves. Typically, sensory nerves receive a signal that they relay to the brain, and the brain then decides if the stimulus is painful or soft. Namirsa offers non-invasive and unique programs for targeting key performance areas, activating your muscle fibers, blocking signals of pain, and promoting long term therapy. You can use an EMS unit for dynamic warm-ups, performance boosting workouts, building muscle, recovery, and short- and long-term pain relief. Your muscles don’t know if you’re using EMS or lifting weights. When you do both, Namirsa recruits your muscle fibers to help take your workouts to the next level. The Namirsa device allows you to add additional resistance to the muscle without having to lift as much weight. This helps keep stress off of the joints while you to work towards your goals. Clinical studies have found that EMS (or NMES) can help build muscle and provide a variety of performance-enhancing effects. Some of these effects are increasing muscle density, increasing strength, and power output for strength and cardiovascular performance. Namirsa is a proud sponsor of SCW Fitness Education and SCW MANIA® conventions. To connect with a Namirsa representative, or register for an upcoming MANIA® conference, visit our website at: www.scwfit.com/MANIA. To register and attend the expo for FREE, visit www.scwfit.com/expo. Barre Above® is a barre certification program for fitness professionals. It blends the latest exercise science with the principles of the Lotte Berk method (the genesis of the Barre movement) delivering a fusion of ballet, Pilates, yoga and strength training workouts. The program is designed to accommodate a wide range of fitness levels, ages, body types, and is complete with progressions so participants new to fitness alongside seasoned Barre enthusiasts together will always feel challenged. If you push yourself to the appropriate levels in your workouts with your instructor, you will feel and see results after about seven to 10 classes. Everyone responds to exercise differently. However, if you focus on form and continually challenge yourself as you take each class, you will feel and see results quicker. Barre Above® is a full body workout, but like most barre workouts there is a medium emphasis on the lower body and core. While some of your Barre Above classes will not include any equipment, you’ll find that most classes always require a mat. Some classes incorporate small fitness accessories that can either help make the exercise more challenging for you or help to add more range of motion in the exercise. These include a small pliable ball, the Bender Ball, Gliding discs, hand-held weights, and resistance tubing. Barre Above® is an 8-hour live certification for fitness professionals, and is for any fitness level, body type, and age! Whether you are just starting out or getting back into fitness, you will find that Barre Above® is challenging and fun for anyone. Register to attend a Barre Above® certification at SCW MANIA® on our website (www.scwfit.com/mania/). There are no pre-requisites for you to become certified. Whether you are just starting out or getting back into fitness, you will find that Barre Above® is challenging and fun for anyone. The certification day includes both workouts and moving lecture. We recommend that you arrive at least 15 minutes early to your workshop. The day will start out with an introduction of our Barre Above® program and some notes. Come prepared with layers or a change of clothes as we stop and start several times. The day will be jammed packed so please bring snacks and a lunch with you. The workshop will wrap up with answering any questions you may have, explaining our ongoing education program, and finally receiving your certificate! Savvier Fitness’ Barre Above® is a proud sponsor of SCW Fitness Education. To register for an upcoming MANIA® and receive more information or take a certification, go online (www.scwfit.com/mania) and register today! To register and attend the expo for FREE, visit www.scwfit.com/expo. OneDay2Wellness owners Bruce and Mindy Mylrea take you “In the Kitchen” to share clean recipes made in their own home! As part of an effort to provide the world with improved health and well-being, Bruce and Mindy deliver easy-to-implement, evidence-based nutrition plans that promote sustained health and weight loss. Check out this recipe for Vegetable Stir Fry, “In the Kitchen with Bruce and Mindy! Come to a MANIA® near you to meet Bruce and Mindy Mylrea in-person, gain more delicious ideas for healthy meals & attend their One Day to Wellness Certification! Each and every SCW MANIA® offers a wide variety of nutrition courses every single hour. Register now at: www.scwfit.com/mania.